Representatives from eight ethnic armed groups took part in a training program offered by the Cambodia-based Centre for Peace and Conflict Study from July 7-11. The officials – all of whom represent groups that have signed the nationwide ceasefire agreement – are taking part in a four-part leadership training held by the peace-building centre. P’doh Saw Hla Tun, joint secretary of the Karen National Union (KNU), said the training is aimed at helping overcome challenges in Myanmar’s peace process. “The training helps provide qualifications for the peace process, including the dos and don’ts for overcoming challenges,” he said. 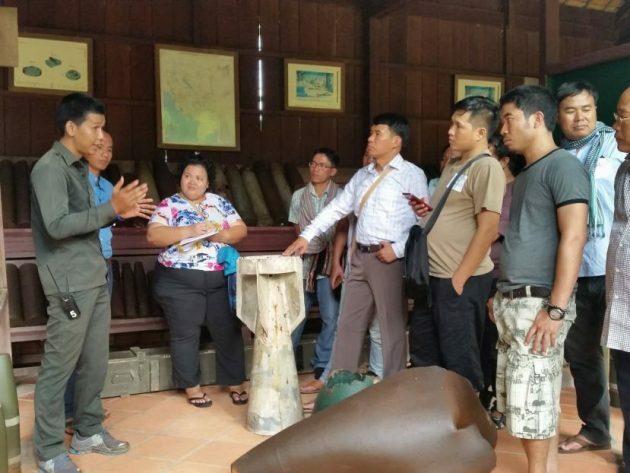 Twenty officials from the liaison offices of the eight ethnic armed groups and military officials attended the Siem Reap training, which was the second part of four modules that will be taught in sections to the same participants. The most recent training included lessons as well as excursions to nearby places such as the War Museum. “We will share what we have learned by teaching these lessons to our subordinates,” said P’doh Saw Plo Soe Win, head of the KNU’s Megui-Tavoy District Liaison Office. The centre started the modules with Myanmar peace leaders in May. The third and fourth modules will be taught in September and November.